Natio Ageless Brightening Eye Cream Review - Should You Buy It? The following review is on a product called Natio Ageless Brightening Eye Cream, which claims to brighten, hydrate, and lift the skin around the eye while reducing the appearance of wrinkles. 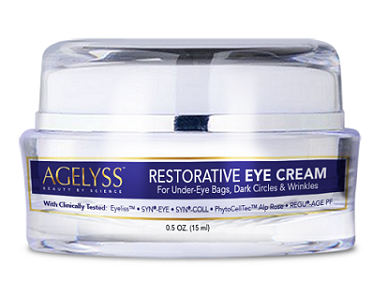 However, is this product the best solution for more youthful-looking eyes? This review will examine various aspects, such as ingredients and customer support, to help you determine the answer. What’s in Natio Ageless Brightening Eye Cream? This product has a range of ingredients listed in the formula and, unfortunately, doesn’t explicitly state which ones are the key active ingredients. Of the long lost, we have selected a range of ingredients that may serve beneficial in delivering on some of the manufacturer’s claims. Glycerin hydrates and revitalizes the skin while Vitamin E is an antioxidant that protects the skin from the damaging effects of environmental impacts like free radicals. Polyacrylamide promotes the retention of moisture as it is highly water-absorbent, which helps to hydrate and nourish skin under the eyes. Phospholipids are quick-absorbing substances that support anti-aging properties, regulating the moisture balance of the skin to prevent the appearance of wrinkles. Palmitoyl Pentapeptide-3 stimulate the synthesis of collagen to promote plumpness of the skin while reducing visible signs of aging. While these ingredients may be beneficial in delivering more youthful-looking eyes, the lack of patented ingredients may suggest that this product is less effective than competitor brands that do offer them. Patented ingredients are clinically proven to deliver superior and targeted results; such as Pronalen Fruit Acids AHA-50 (which promotes cellular renewal) or PhytoCell Tec Alp Rose (which promotes the longevity of skin stem cells to support younger looking skin). In saying so, the extent of this product’s effectiveness may be limited. How Do You Use Natio Ageless Brightening Eye Cream? Unfortunately, Natio offers vague instructions for the use of their product, simply suggesting that the cream should be patted gently around the eye in the morning and evening. The state of the skin, the amount to use per application, the lifespan of the product, or any precautions are not stated. What’s more, there is no information given on the concentration of ingredients which prevent us from determining if this product is accurately dosed or not. This brings the product efficacy into question. 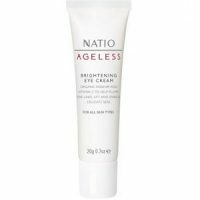 Natio Ageless Brightening Eye Cream can be bought directly from the manufacturer’s website, where a 0.7 oz. tube retails for $18.95. This may be considered more affordable, however, the lack of any effective patented ingredients means that this product may need to be used for a long period of time for it to deliver results. This may cause the costs to increase in the long run. There are bulk offers available to support this. It’s unfortunate to note that there is no guarantee for partially used products offered by the manufacturer, meaning that unsatisfied customers are not eligible to receive a refund. This is a concern and may suggest that the manufacturer is not confident in the product’s ability to fulfill their claims. Furthermore, there are too few customer reviews to confirm the claimed effectiveness of this product. This product contains a wide range of ingredients that, although we were uncertain which were active, benefit the skin in a variety of ways. However, the absence of patented ingredients is a concern as this may limit this product’s effectiveness when compared to alternative brands on the market. Although the low cost may be appealing, customers may have to use this product for an extended amount of time before the can see results. The guarantee is limited and there are too few customer reviews to confirm the claimed effectiveness of this product. 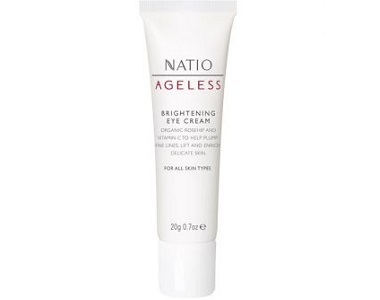 In saying so, we do not recommend Natio Ageless Brightening Eye Cream as a wise purchase choice.